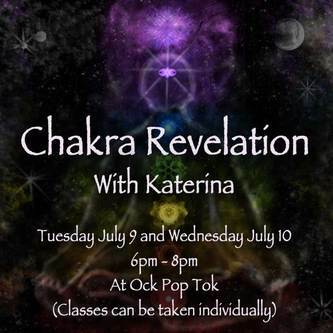 These classes aim to bring new understanding and new experience to a well-known term - chakra. Translated as "a wheel" and representing an energy center in our body, chakra is one of the main yogic concepts. To harmonise our daily life we need to activate and balance our chakras. The Chakra Revelation classes are based on the minimum theory which summarises the knowledge about the chakras in a simple and easily understood way. To illustrate our topic and make it more visual we will watch a short, but inspiring video about the chakras. Mostly we will focus on experiencing our chakras through different kinds of practices: yoga asanas, music meditation, dance and vocal toning. All these practices correspond to particular chakras and are meant to help us explore them deeper from different perspectives, thus giving us more comprehensive experience. Classes can be taken individually or together. What is chakra? What is the importance of chakras? Vocal toning with the chakra activating sound. We invite you to take this exciting journey through our 7 chakras, 7 energy centers, 7 different aspects of our being and experience them through different practices so you can apply them in your life.